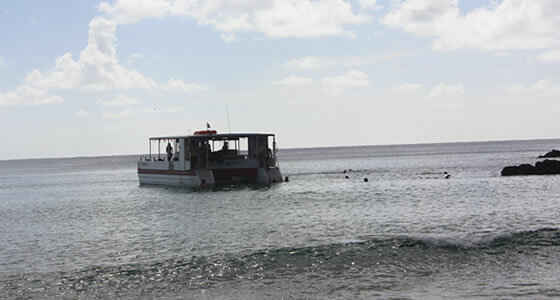 Boat Tours in Fernando de Noronha. Noronha is a beautiful island in the middle of the Atlantic. Exploring its beaches on top of a boat is essential to any visit to Paradise. For those not inclined towards water sports and diving, a good way to explore Fernando de Noronha and experience its marine life is by taking a boat tour, which usually runs along the inner coast (or the Mar Dentro) of the island, with each one lasting around 3 – 4 hours. These tours which are usually made on converted fishing boats and can either be organized by your hotel or at the Port where several operators have their offices. Boats are not allowed into the Baia dos Golfinhos, but tour operators are allowed to take boats to the edge of the bay. These tours, usually operated in the afternoon, provide an almost guaranteed opportunity to see the famous Spinner dolphins of this region. Tours stop at areas that have shallow pool formations and other areas suitable for swimming, such as at the Praia do Meio where you can also see the Pedra do Piao or “Spinning Stone”, which is a huge oval stone that appears almost like it is balancing on its very tip, atop several smaller stones, while a visit to Ponta da Sapata will provide a view of a curious landmark, where a hole on the rock forms a map of Brazil. Tours also take visitors out to snorkeling and diving sites which can only be accessed by boat, such as snorkeling tours to Baia do Sancho.